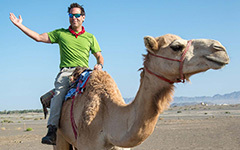 Summer is not a quiet time in the William & Mary Geology department. Pop onto the 2nd floor of McGlothlin-Street Hall this summer and you’ll find a bevy of undergraduates pursuing research on an array of topics including paleoclimatology, geochemistry, petrology, hydrology, paleontology, coastal geology, and structural geology. After a few weeks of indoor work, the Structural Geology & Tectonics research group was ready for fieldwork. Rising senior Mary Donohue’s thesis research is focused on deciphering the kinematic history of metamorphic rocks exposed in central Virginia at the boundary between the Blue Ridge and Piedmont geological provinces. Her study area frames the James River State Park, which occupies 1,500 acres in western Buckingham County and includes a glorious 5-km stretch of the James River. Mary’s research goal is to decipher the geologic history of the park, and tell the story of the rocks, river, and landscape in a manner that’s engaging to the public. Communicating our results to a broader audience is an important part of doing geologic research. 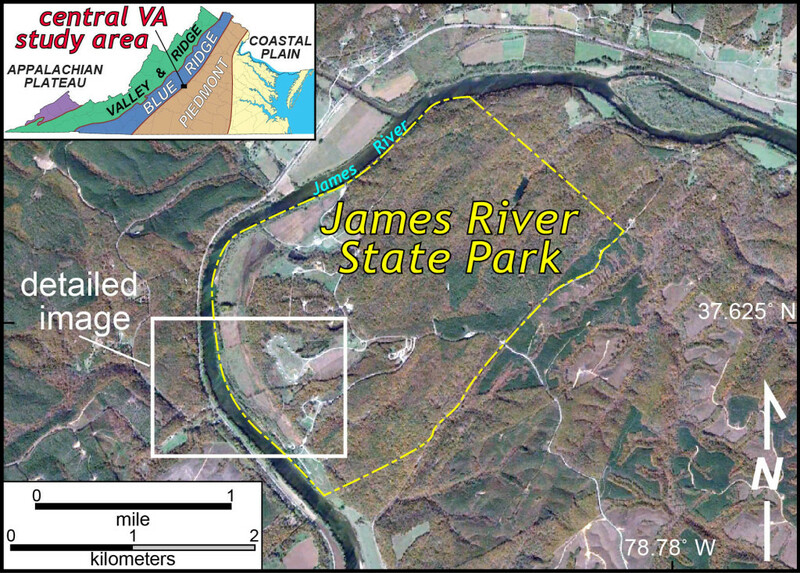 Locator map and aerial imagery of the James River State Park area in central Virginia. 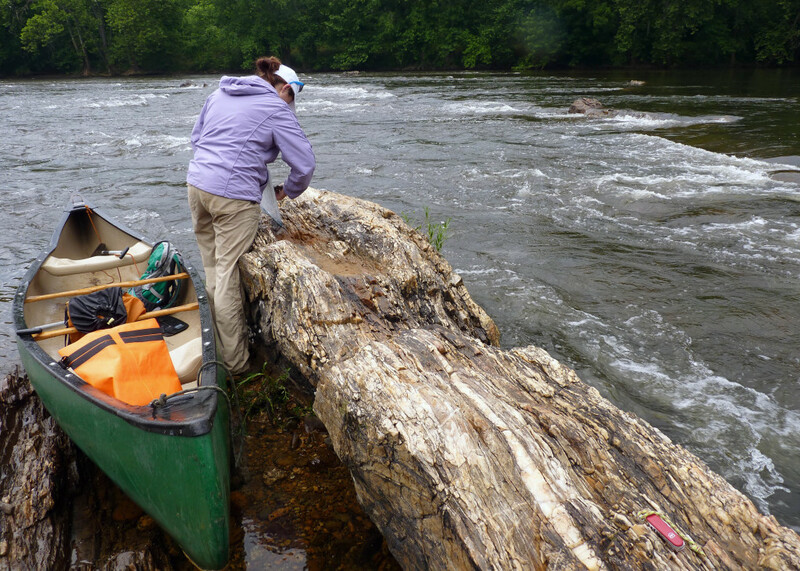 We started this research effort last Fall in the Geological Field Methods course, and returned to the the park over the summer solstice as the long days and warm temperatures afforded us the opportunity to properly explore outcrops in the James River’s channel. Virginia’s humid temperate climate does a number on the bedrock. Under these conditions bedrock is thoroughly weathered and typically covered by soil. Just finding outcrops in the Piedmont can be a challenge. The channel of the James River with its bottom covered by pebbles and cobbles with a few bedrock outcrops poking out of the water. Note my 17’-canoe for scale- more on that old river-beaten canoe in my next post. William & Mary geologist Mary Donohue in front of an impressive outcrop of well-foliated phyllite. View to the southwest. Much of the park’s bedrock is phyllite, a well-foliated mica-rich metamorphic rock that originally was deposited as mud in an ancient ocean. There are, however, distinct layers of metavolcanic schist, marble, and quartzite interlayered with phyllite – these are enigmatic rocks whose provenance is not well established. Long after these rocks were deposited they were deeply buried, recrystallized, and deformed. Exhumation and erosion have brought these rocks back to the Earth’s surface. In central Virginia the James River’s channel is about 150 meters wide and edged by 3 to 4-meter (10 -12’) tall banks of sand, silt, and mud. Every year or two, the James completely fills its channel and floods out onto the flat terrain beyond its banks. As the water recedes it leaves behind fine-grained sediment and in the process builds its floodplain. The floodplain, with its gentle slopes and rich alluvial soils, has long been used for agriculture and the Park manages some of the floodplain as wetland habitat for wildlife. 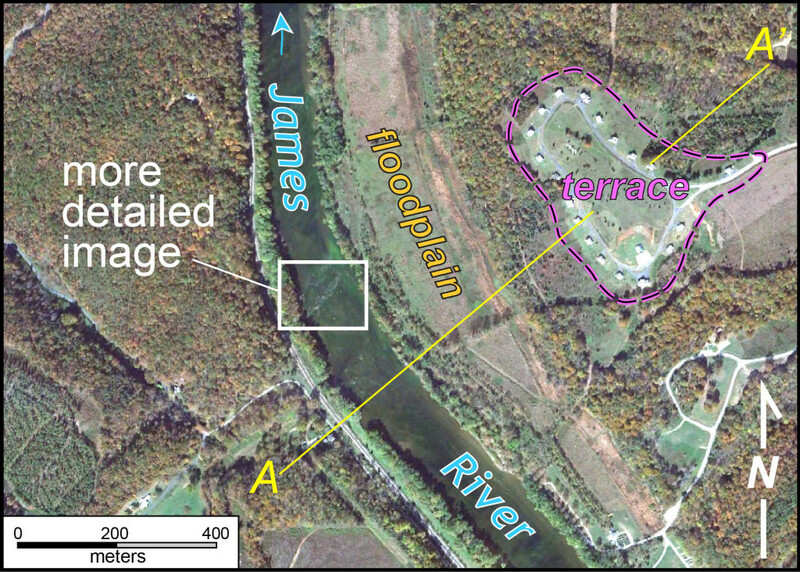 A more detailed image of the James River at the James River State Park with the floodplain and a terrace highlighted. The cabins at the park are located on a river terrace ~40 meters above the modern river channel. At the James River State Park there are a number of flat (well, flattish) hills that occur ~40 meters (130’) above the modern river channel. These topographic uplands are underlain by red silty soils that pass downwards into weathered rounded gravels that sit unconformably above the metamorphic rocks. These are river terraces, bits of a relict landscape that once formed the channel and floodplain of an ancient James River. At some time in the past, these terraces would have been the lowest spot on the landscape, but as the James River eroded its channel and cut deeper into the landscape these features were abandoned – left high and dry. Topographic and geologic cross section illustrating the James River’s channel and floodplain as well as an ancient river terrace. The floodplain is underlain by silt and sand (yellow) deposited during floods. The terrace is underlain by weathered silt, sand, and gravel (light brown). The cross section is vertically exaggerated by a factor of 4. 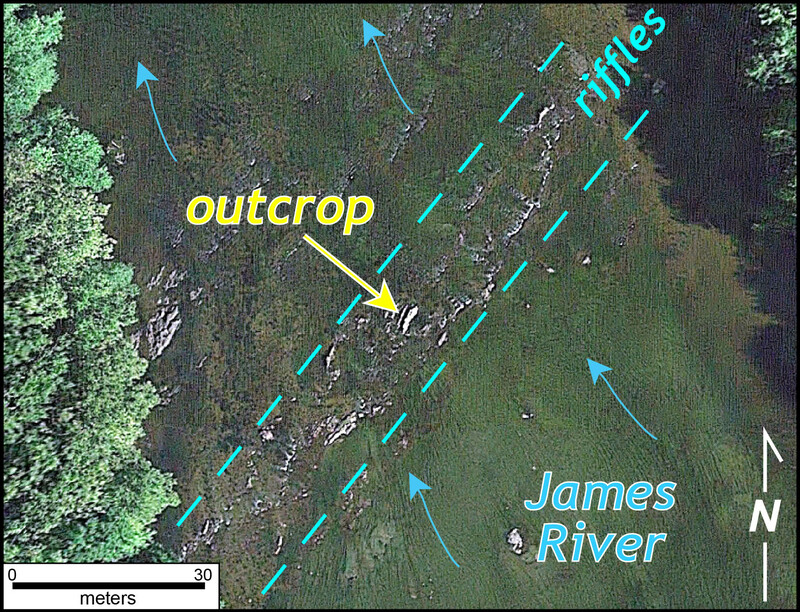 The imagery below nicely illustrates a set of riffles that angle diagonally across the James River. 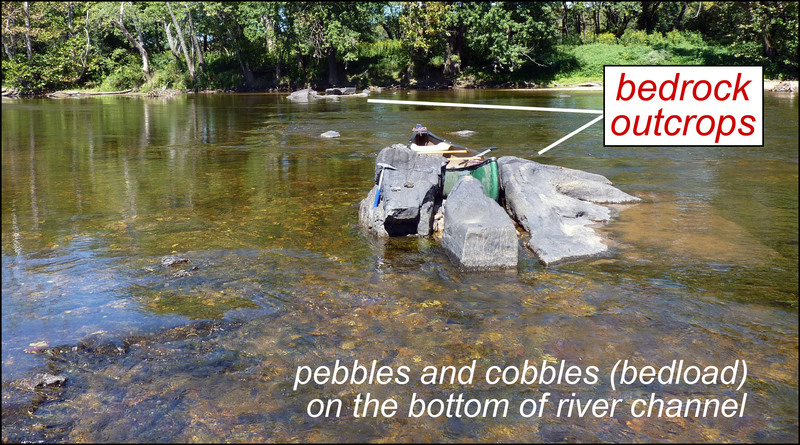 Riffles commonly occur where the river crosses a hard, more durable layer of bedrock. At this location a 15-meter (50′) thick layer of quartzite is interlayered with phyllite. On this trip we took to canoe and kayak to visit these mid-channel exposures. A close-up view of the James River’s channel at low water. Notice riffles and bedrock outcrops. At river level, with ~50 cubic meters of water (~1,900 ft3) water coursing by per second, this is what the outcrop looks like. It’s a gnarly lump of bedrock. Quartzite outcrop in the James River (view to the northeast). 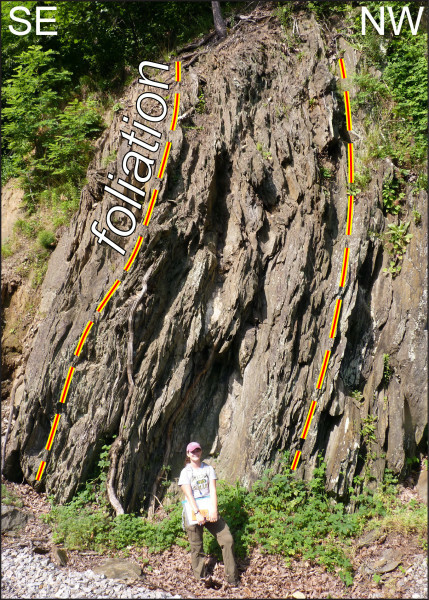 Geologist Megan Flansburg (W&M Geology ’15) measures the orientation of geologic structures. Note my 17’-canoe for scale – more on that old river-beaten canoe in my next post. The layering (most likely foliation) in the quartzite is oriented (strikes) in a northeast-southwest direction and dips steeply to the southeast. Layer-parallel quartz veins are common, and there are a few younger veins at high angles to the layering. Take a look at this more detailed view of the outcrop (below) – this perspective is looking down on the nearly horizontal upper surface of the outcrop. The foliation-parallel veins are abundant, and cut by a particularly photogenic fault. 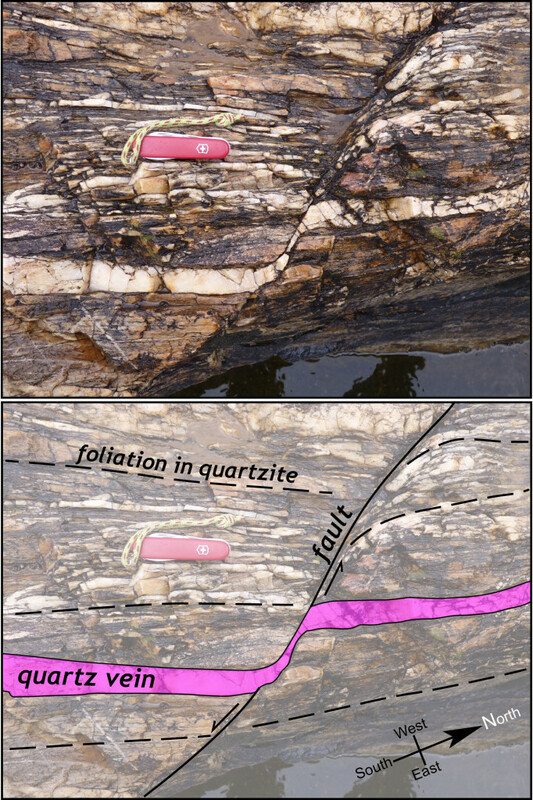 One quartz vein is offset, in a right-lateral or dextral fashion, by ~8 cm (~3”) along this fault. The quartz vein did not break, rather it was deflected and behaved in a ductile fashion during shearing. These are the kinematic clues, that when considered with observations from many outcrops will provide the data we need to understand the structural geology of the Blue Ridge-Piedmont terrane boundary. Detailed view of quartzite outcrop in the James River. Annotated image at the bottom. We collected two oriented samples from the mid-river outcrop; in the lab we’ll cut the baseball-sized chunks of rock into slabs and prepare thin sections to examine the microstructures preserved in this rock. There is much more to discuss about the splendid geology at the James River State Park, but I’ll save that for Mary as her research progresses during the academic year. I’ll close this post with a comment about scale: studying the Earth involves thinking about different scales (in both time and space). Rocks exposed in the James River State Park formed 100s of millions of years ago, and have been modified by processes that are, by any measure, slow. The river terraces are younger, having formed between one and two million years ago; that’s geologically ‘young’, but ancient by human standards. Yet, at the other extreme, major floods can greatly modify the landscape overnight. Spatially, the first aerial imagery covers a broad area (~30 km2), yet landscape features are evident even at that distant scale. As we zoom into ever more detailed scales more of the geologic story emerges. At a moderate scale (~0.01 km2) the riffles in the James River illustrate key aspects of the geologic structure, and at an even more detailed scale (the outcrop-scale, <1 m2) the character of foliation and faults is clearly revealed. The scale of things is important. Chuck, I enjoyed reading a few of your post, especially this one about the James River and Piedmont. Looks like very enjoyable work, I have an 8 year old who has been bitten by the rock bug. He may join you one day at WM if you are still there. I will be sharing a few of these post with him. Thanks for the map and information about the rocks and formations at JRSP and along the river – it is great to know something about them instead of just seeing “obstacles” to our canoes and kayaks each summer when the water levels drop. See you this fall when your group returns to the park!